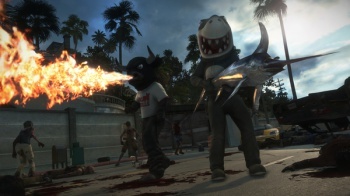 Dead Rising 3 Producer: "Capcom's Had Its Missteps, It's Learning"
The producer says to expect "a lot of big stuff" from Capcom over "the next couple of years". Capcom seems to be one of those old-school videogame companies that just can't keep up with the times, with recent big-name flops such as Resident Evil 6 and the recent Devil May Cry reboot contributing to its lackluster earnings in financial year 2013. The company turned a profit of just $33 million in the year ending 31 March 2013, but Dead Rising 3 lead producer Mike Jones believes that while Capcom has had it's missteps, it is starting to learn from it's mistakes. He says it just needs time to "find its place" in the evolving gaming landscape. "Capcom is in a growth and adjustment period. The game's changed, new consoles are coming out... Everything's not out there in the open, right? There are portfolio discussions about next gen and mobile and digital and all this kind of stuff. They're well aware of our history, our strong properties, strong franchises, and they absolutely want to make the best content for gamers." Specifically regarding those less-than-stellar decisions we've seen Capcom make in recent times, Jones says "Sometimes [Capcom] makes mistakes. Sometimes they work with partners who - sometimes games won't come out right, because there isn't enough funding or time or whatever it is, but they're trying and I think they're on the right track. If you look at their track record over the past year or two, there have been some successes in there, some failures in there, and a lot of lessons to be learned. "People are listening and they're learning, and I think you'll see a lot of big stuff over the next couple of years," he added. Jones is especially optimistic over the launch of the next-gen consoles, stating "I think as the new console generation develops, there's a lot of new stuff coming. Deep Down on PS4, Dead Rising 3 on Xbox One, trying to bring back Strider... "
So what do you think? Can Capcom redeem itself, or is it as dead as Mega Man Legends?